Coix Seed - also known as Job's Tears. Storage Conditions: Cool & dry place. 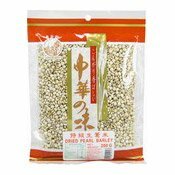 Simply enter your details below and we will send you an e-mail when “Dried Raw Pearl Barley (Jobs Tears Coix Seeds) (壽星牌生薏米)” is back in stock!